Full Home Renovations | Sarnia | Carosyl Home Additions Inc. Your primary concern when you were house hunting may have been location, but now that you have settled into your home, you may be looking to make some improvements. There might be rooms that just don’t feel like home – and that’s where we come in! At Carosyl Home Additions Inc., we would love turn your house into the home you’ve always dreamed of! 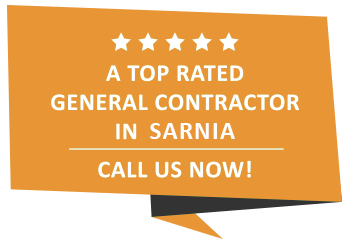 As a premier general contracting company in Sarnia, we are here to fulfill your home renovation needs. Whether you want to update the floorplan or improve the appearance of your kitchen, we can help! Renovate your home with Carosyl Home Additions Inc.! Having offered a high-quality exterior siding installation service to our Sarnia customers since 1981, it is fair to say that we know a thing or two about delivering a real and lasting product. Offering a range of different siding materials from hardwood to vinyl, our skilled team of siding experts are equipped with the skill and expertise to ensure that your home feels the full benefits of a proper siding service without breaking the bank. The unfortunate truth is that many people feel that installing a new roof is little more than nailing some shingles and taking it from there. Thankfully, the skilled team of roofing experts at Carosyl Home Additions Inc. knows better than that. Our expert team provides a thoroughly complete service that provides protection against all that mother nature can throw at your Sarnia home. Staying up-to-date with all the latest roofing techniques allows our roofing specialists to provide the most comprehensive roofing service available. There is no doubt about it, hardwood flooring refinishing and installation can define your entire home. A freshly installed floor service is a perfect way of updating the look of your home, while also adding immediate value to it. On top of that, our quality and reliable hardwood floor refinishing service involves the surface of your home being sanded back to remove any stains, gouges or dents. This can result in a new lease of life being added to your Sarnia home. Let’s be honest about it, with the possible exception of your home’s bedrooms, there is no room in your Sarnia home that is more important than the kitchen or bathroom. In most homes, these two rooms are like to be two of the most used rooms. Given their frequent usage and the high volume of foot traffic that they often encounter, it stands to reason that they may need more regular renovations than other rooms. So, whether you are looking for a new floor tiling job for your bathroom or want customized kitchen cabinets made, we can help. What better way to enjoy the summer and fall in Sarnia than with a tailor-made porch or deck where you can cook barbecues, entertain guests or simply relax with a book and a glass of wine. The great thing about a porch or deck is that it adds an exterior room that gives your home an entire new dimension. Whether installed on the inside or outside of your Sarnia home, the simple fact of the matter is that top-quality molding service from Carosyl Home Additions Inc., will have an immediate and lasting impact on your home’s aesthetic and functional features. Whether you are a young family who have had some recent additions, or a more mature couple who are looking to remodel the layout of your home after your kids have gone to university, we can help. With years of experience in all facets of constructing new rooms and story additions, there is no challenge too big or task too small for our skilled team of construction specialists. We know how stressful it can be to have work done to your home, and we strive to make the renovation process an exciting experience for everyone involved. To ensure the project goes as smoothly as possible we implement superior project management, financial planning and budgeting services. Your satisfaction is important to us, and we do what we can to exceed your expectations. Have you ever moved into a home and loved every bit of it except the basement? Maybe this is the kind of situation you’re in right now! At Carosyl Home Additions Inc., we know just how you’re feeling. You’ve probably decided to just use it as a storage space to be visited when you need to get a lightbulb, a new bottle of shampoo, or bring up some holiday decorations. But what if we told you that doesn’t have to be the case? For a small investment, you can transform that damp, dark, basement into a family room or an office or a guest bedroom, or depending on the size—all three. The average return on investment in Sarnia for a basement renovation is 75 cents on the dollar, which is pretty good for home improvement considering all the renovations out there that aren’t going to pay you back should you choose to move. A 1,500 square foot home could be transformed into a 3,000 square foot home with the right swings of a hammer and clever construction by the experienced team at Carosyl Home Additions Inc.
Not only this, but a basement renovation lasts. When it comes to smart investments, affordable and long-lasting decisions are what will get you out ahead every time. Whether you’re building a family room, kid’s room, or man-cave, your basement can be updated to save you money in the long-run. The Carosyl Home Additions Inc. team will assess the current situation and update as required to incorporate as many energy-saving features as possible, from better insulation to better flooring, to Energy Star appliances. As a bonus, additional insulation will also help to soundproof your basement! Like with any renovation our Sarnia clients are always interested to learn more about renovation costs. While many renovation contractors will try to sell you high, at Carosyl Home Additions Inc. we are focused on client satisfaction and aim to work closely with you to accomplish home improvements within your budget and timeline. The first step to 100% customer satisfaction involves free estimates. When you give us a call we’ll meet you in your home to provide you with the most honest assessment we’re able to and then determine your needs from there. Whether it’s a basement renovation, addition, condo renovation, or floor refinishing assignment, our dedicated and efficient team will always be fighting in your corner. An A+ accredited business with the Better Business Bureau, in more than 36 years of business we’ve worked to keep up a strong reputation amongst our many Sarnia clients. When you’re looking for a renovation contractor that cares about accomplishing your full home renovation exactly the way you picture it, we’re the team for the job. Give us a call today, even if you just have questions! We’re happy to talk.